For those of you who have been following Daya's progress or are just interested in rehabilitation or maybe you just love dogs. Here is her newest update and a bit of my heart put into words. Taking in dogs isn't really that complicated. It takes patience, the major kind and it's tough sometimes - I know I've said it many times before and I know I will continue to say it many more times. It challenges me, sometimes on a daily basis but not because it's complicated. And this is not a popularity thing. I know it is so hard for these dog owners to be on their last resort by contacting me and then even taking the next step and handing these dogs over. And even harder to read my assessments - that first post is always the toughest to read for everyone. And I know this, not just because of the feedback I receive because I sure do get that. But that's still not it, I know it because I know what it is like to fail. Giving up a dog that you paid money for, loved and tried hard to make it work and then giving it up, feels like failure. Perhaps it even is failure, that's not my call and not what I'm here to do. But the response from most of the families that call on me for assessments or help of any kind with their dogs, is almost always a defensive one. I get it and I honestly understand. I am not a master at this and make no claims, I have learned through my lifetime and still am learning. I came about to learn what I have, through my own mistakes. There is always a price attached to a lesson, we pay one way or the other. So I get it. The dogs however are incredibly eager to please and the most forgiving of any animal I've known yet. Perhaps this is why I feel such a close bond with dogs. They get us and don't hold it against us. They inspire me to be a better human. These posts are in no way about the past owners or the past of anything and I try my best to make that clear. It's possibly hard to read or hear for many and that's ok. I am not doing this for popularity or for recognition, I am not looking for approval nor do I need it. I am simply here for these dogs and will continue to speak here for them. As it is my only desire in doing so, for their hearts be heard. 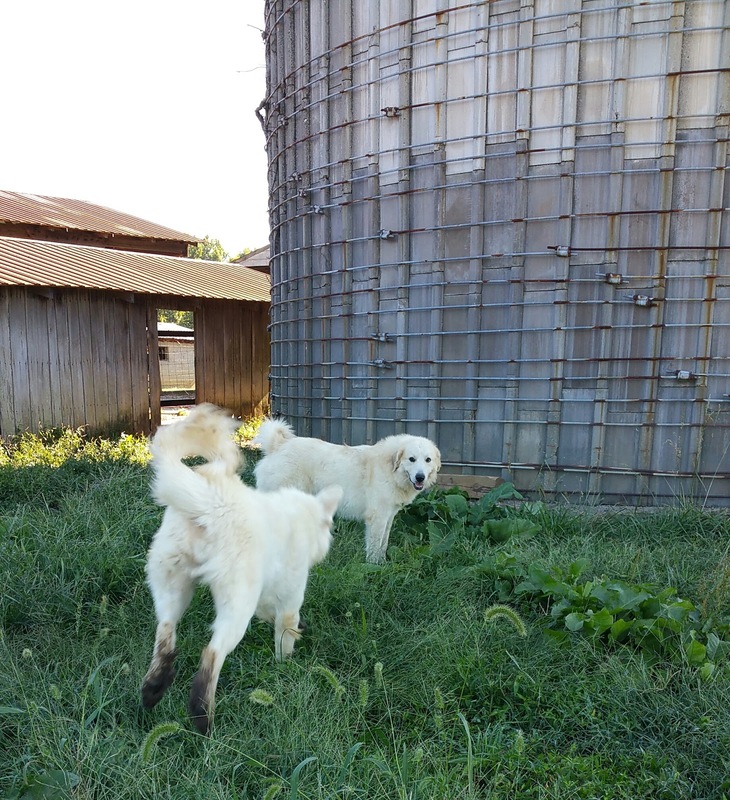 When the dogs first come here, they're usually confined to a small paddock where their behavior can be assessed. Most often the parameters of that paddock are challenged. They dig, try to climb. Sometimes they bite, they're angry especially if they've been roaming free and now can not. They're angry over everything and acting out is expected. Dogs are routine animals and change is usually hard for them. So to be confined somewhat here, teaches them and me so much. It's necessary for them to also realize again that they're dogs. Most often they've lost themselves somewhere along their life and they don't know who they are or what they wanna do or be anymore. All who have come here, have had no jobs. They've just existed. They've had families at one time or another. All have experienced love and loss. They may have bounced around and had many families or they may have just had one. Many have been backyard ornaments or they've been a neighborhood nuisance and have even wound up in kill shelters. But it is not a bad thing at all for them to find out who they are. It is what we all want and need in life - it is no different for a dog. I call them my pawed or fur friends, I have all sorts of names I refer to them as. But still they are without a doubt, dogs. And it is in no way demeaning for them to discover who they are and to be referred to as dogs. Dogs here are treated like every other living soul and it is a great thing to be a dog. I nurture independence and pride in the dogs. For them to find who they are in the process and for them to be confident in that. A confident, well loved and appreciated dog that knows who they are, is an adaptable, teachable and loyal companion. Not just to humans but to other animals too. It's getting back down to the basics and really discovering who the dogs are, as a human and dog team. Daya has been here about 2 months now and has quickly gained nearly 20 pounds. An excellent quality diet is needed for her activity level and good food very much makes her happy! We are learning together who she is. She has bonded tightly with me and recognizes me as a sister. This is a goal for all the guardians that come here. Great Pyrenees have a distinct disposition, all breeds are so different. But Pyrs, I have found need to be their own masters. They need to be nurtured and guided into discovering who they are. It takes immeasurable patience and time. 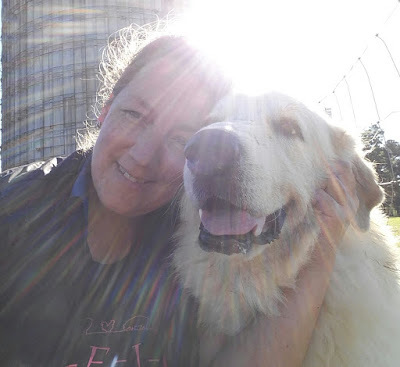 This is true livestock guardian training and it often takes a year or even more often years, for them to be confident in that. Daya is coming around to knowing this rather quickly. Daya is unusual. She is active but has a calm, confident spirit. She is learning to be adaptable and learning to love other animals. She was quickly won over by humans but other animals has really stretched her. She has taken a liking to the sheep and this tells me much. Not everybody gets sheep but Daya does, as do I. Relating to Daya as to how she relates to the sheep flock, and the girl quickly blossoms. Forcing Daya to do anything or using trickery, treats or any type of verbal or physical correction will not work with Daya. She needs a heart connection and she needs to visually see you interacting with the livestock and other animals, as she would. This needs to be demonstrated and related to her in her own language. Her spirit is a beautiful thing to watch. The way she carries herself, her watchful eyes and her attentive mind. She doesn't miss a thing around here. Daya is one of the exceptions, she will be one of the fiercest and most attentive guardians who has ever worked here. 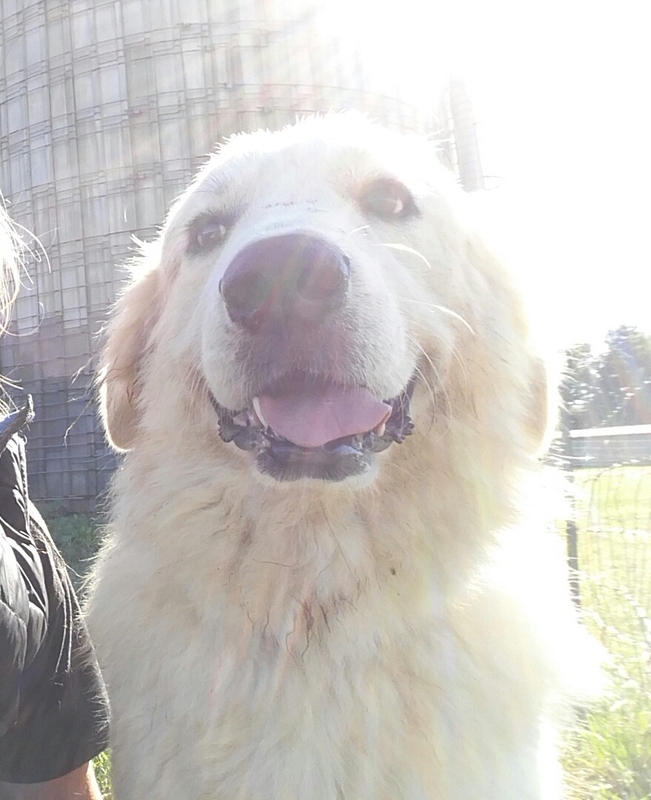 I have not yet decided if Daya will remain here on our farm with us or if she will eventually be adopted out to guard another flock for a farm in need. She is however learning that her home lies within her so whether she stays here or moves on, she will never forget who she is.